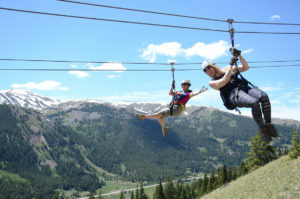 The Standard Two-Hour PROSPECTOR ZIP LINE TOUR: A true Colorado Back Country Adventure. 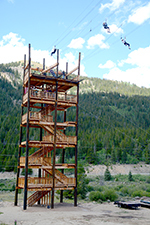 OPEN NOW, 6 ZIP LINE SECTIONS, all with DOUBLE CABLES for safety; OVER 8,000’ feet of zip lines at the Top of the Rocky Mountains. After check-in at the Base Camp at our 2,500 acre Private Preserve, board the 6 ton MONSTER TRUCK, a comfortable 4-wheel drive van up to the first zip line departure deck at 11,200 feet. The shuttle vehicle used will depend upon trail conditions and number of guests booked for the tour time. Experience different elements of speed, distance off the ground and terrain. Fly on One Single Line, side-by-side on 4 TWIN LINES, and side-by-side-by-side on TRIPLE LINES on THE BIG NUGGET, “THE GRAND FINALE”. After completing zip line #5, it’s time for THE BIG NUGGET. Glide down from the NEW OBSERVATION DECK on three thrilling zip lines, past the rocky cliffs on long 850’ cables. Land side-by-side-by-side on our beautiful 100’ tall SKY TOWER. Stop and take photos on the spacious landings as you descend to base Camp on wide stairways. Enjoy magnificent views of the 14ers, Mount Massive and Mount Elbert to the south, and our mountain, Mount Arkansas (an almost “Fourteener”), overlooking the Base Camp. Plan to spend approximately 2 to 2-1/2 hours on this exciting tour. Certain tour times provide an opportunity to see and hear the historic Leadville Colorado & Southern Railroad train as it travels across our property high on the Continental Divide. One zip runs parallel to the tracks while another section runs over the tracks. Fly-overs are not guaranteed but some guests will see the train with an “eagle’s eye” view. Photo Service is on site for all tours. TOUR TIMES: 9:30, 10:30, 12:00, 1:00, 2:30 and 3:30, Arrive 30 Minutes prior to Tour Time.